The fundamental right to “the freedom of speech and expression including publication” in Article 14. (1) (a) of Sri Lanka’s Constitution, as well as the First Amendment to The United States Constitution, and other United Nations instruments, is being seriously undermined by the spate of hate speech prevalent in several countries including Sri Lanka. As a consequence, communities in these countries are being polarized on racial, religious and other distinctions causing tensions among communities to pointsthat could even threaten public security in these countries. The debate is whether unrestrained freedom of speech should be permitted or should it be sufficiently abridged legallyfor the sake of security that is central to the wellbeing of people everywhere. The Media Secretary of the Sri Lanka Ramanna Maha Nikaya Ven. Omalpe Sobhitha Thera addressing a news conference, organized by the Sri Lanka Ramanna Maha Nikaya at Sri Bodhiraja Dharmayathanaya in Narahenpita, said that “vituperative attacks on Maha Sangha with racial undertones have been tolerated by Buddhists all along as they were very patient and compassionate”. Continuing, he had stated: “The objective of those elements is to create racial and religious disharmony in the country and meet their political ends and as Maha Sangha we will not allow that,”(The Island, June 23, 2017). 1.To enact new legislation under provisions of Article 15 (2) of Sri Lanka’s Constitution that states: “The exercise and operation of the fundamental right declared and recognized by Article 14(1) (a) shall be subject to such restrictions as may be prescribed by law in the interests of racial and religious harmony or in relation to parliamentary privilege, contempt of court, defamation or incitement to an offence”. 3. Not to curtail freedom of speech however “vituperative” the attacks with “racial overtones” are, but to identify the persons concerned and to shame and discredit them in order to discourage them and any others from making derogatory comments that are sensitive to the sensibilities of a group or community. 4. Speech that could incite violence but however ugly, does not result in violence should not be categorized as hate speech, because in the case of such speech it is “difficult to prove that someone intended to incite violence” (Dr. Dayan Jayatilleka, Colombo Telegraph, June 21, 2017. On the other hand, speech that leads to violence at some future date and could be directly identified as the source that inspired the violence, should be categorized as hate speech, just as it does with speech that calls for violence being followed by violence. Those responsible for such speech should be held accountable to the full extent of the law. Despite these constitutionally guaranteed freedoms on how to accommodate speech that is provocative and ugly, it has become a hot topic in the U.S. An article in The Washington Post of June 25, 2017 titled “No, hateful speech is not the same as violence” states: “Recent confrontations across the country reflect a growing tendency to answer speech with violence…But while there is a continuum of acceptable speech, language and violence should not be confused. The way to preserve our freedom of expression is to insist that speech, no matter how offensive, cannot justify violent reprisal”. “U.S. law disallows several categories of speech that edge close to violence. For instance, a direct rallying cry to attack can constitute incitement to imminent violence, rendering such speech unlawful. Verbal “true threats” to do physical harm to someone are also prohibited and punishable, as is systematic harassment. Yet a great deal of hateful speech – racial provocations, invective, supremacist sloganeering – is protected by the First Amendment”. It is evident from the foregoing that it is not content, but the manner in which the content is vocalized that generates tensions among communities to a degree that could even threaten public security. The statement issued by the Mahanayake of the Asgiriya Chapter affirms this point of view when he says: “Although we do not approve the aggressive behavior and speech of Bhikku Galabodaatte Gnanasara the viewpoint expressed by him cannot be discarded. 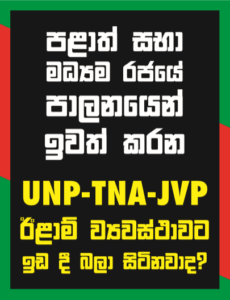 Insulting Bhikkus by various groups without inquiring into the veracity of the issues raised by him cannot be condoned” (http://www.lankadeepa.lk).